In this entry we’re going to focus on building Apple Watch apps that can communicate back and forth with the host application running on the iPhone. This is extremely important since the Apple Watch provides a second screen/peripheral complimentary experience to the main app running on the iOS device – be it a remote control, or quick view/glance into whats happening within the bigger picture. 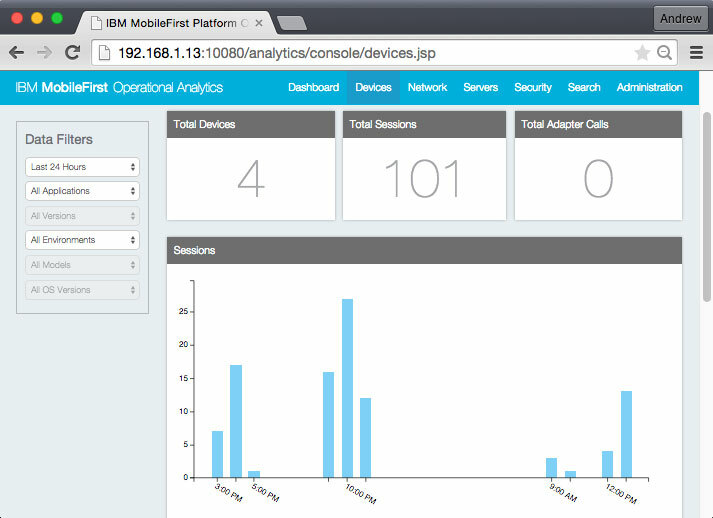 In my last post I showed how to setup remote logging and instrumentation/analytics in an Apple Watch app using IBM MobileFirst Platform Foundation server. I used the methods described below for communicating between the WatchKit and host apps in the sample app from that previous post. At first thought, you might think “oh that’s easy, just use NSNotificationCenter to communicate between the separate classes of the application”, but things aren’t exactly that simple. An Apple Watch app is really made of 3 parts: 1) the main iOS application binary, 2) the user interface on the Apple Watch, and 3) the WatchKit extension binary (on the iOS device). Yep, you read that correctly, the WatchKit extension (which controls all of the logic inside the Apple Watch UI and resides on the iOS device) is a separate binary from the “main” iOS application binary. These are separate processes, so objects in memory in the main app are not the same objects in memory in the extension, and as a result, these processes do not communicate directly. NSNotificationCenter isn’t going to work. However there are definitely ways you can make this type of a scenario work. 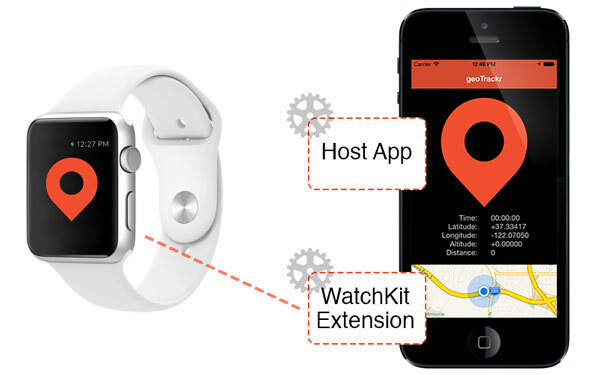 First, WatchKit has methods to invoke actions on the host application from the WatchKit extension. WatchKit’s openParentApplication or handleWatchKitExtensionRequest methods both provide the ability to invoke actions and pass data in the containing app, and provide a mechanism to invoke a “reply” code block back in the WatchKit extension after the code in the host application has been completed. Inside the host application we have access to the userInfo NSDictionary that was passed, and we can respond to it accordingly. For example, in the code below I am setting a string value on the userInfo instance, and taking appropriate actions based upon the value of that string. watchKitHandler = [[UIApplication sharedApplication] beginBackgroundTaskWithName:@"backgroundTask"
This covers the “pull” scenario, and is great if you want to invoke actions within your host app from your WatchKit extension, and then handle the responses back in the WatchKit extension to update your Apple Watch UI accordingly. What about the “push” scenario? The previous scenario only covers requests that originate inside the WatchKit extension. What happens if you have a process running inside of your host app, and have updates that you want to push to the WatchKit extension without an originating request? There is no shared memory, and it is not a shared process, so neither NSNotificationCenter or direct method invocation will work. However, you *can* use Darwin notifications (which work across seprate processes by using CFNotificationCenter). This enables near-realtime interactions across processes, and you can share data as attributes of a CFdictionary object based between processes. You can also share larger amounts of data using access groups, and notify the separate processes using the CFNotificationCenter implementation. Note: CFNotificationCenter is C syntax, not Objective-C syntax. First you’ll need to subscribe for the notifications in the WatchKitExtension. Pay attention to the static id instance “staticSelf”… you’ll need this later when invoking Objective-C methods from the C notification callback. From within your host app you can invoke CFNotificationCenterPostNotification to invoke the Darwin Notification. Then in the WatchKit extension, handle the notification, and update your WatchKit extension accordingly. We’ve now covered scenarios where you you can request data or actions in the host application *from* the WatchKit extension, and also how you can push data from the host application to the WatchKit extension. Now, what if there was a library that encapsulated some of this, and made it even easier for the developer? When I wrote the app in my previous post, I used the methods described above. However, I recently stumbled across the open source MMWormhole, which wraps the Darwin Notifications method (above) for ease of use. I’m pretty sure I’ll be using this in my next WatchKit app. 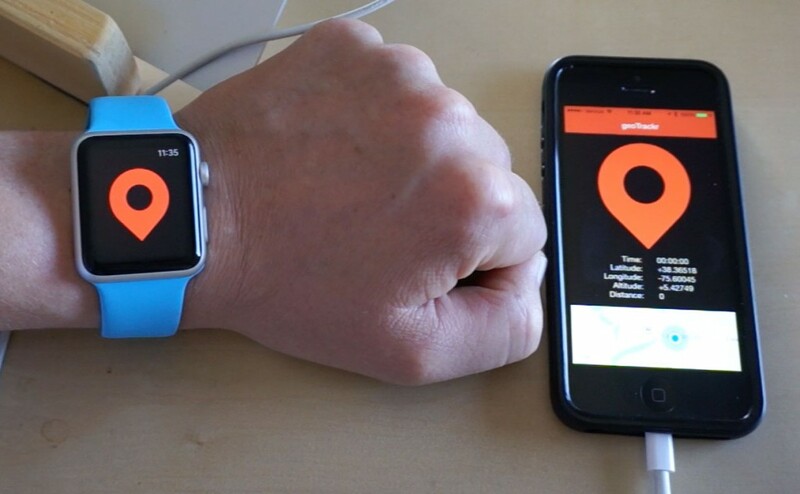 This is the first entry in a multipart series on powering native iPhone and Apple Watch apps using the IBM MobileFirst Platform. In this entry we will cover how to setup the MobileFirst Platform for use within Apple WatchKit apps and leverage the operational analytics and remote logging features. The app is a simple location tracker. Think of something like a much simpler version of Run Keeper that will allow you to track your location path over a period of time, and show your location on a map. We’re also building a WatchKit app that enables you to quickly start or stop tracking your location without ever having to pull your iPhone out of your pocket. All of this powered by IBM MobileFirst. This means that when you run Apple Watch apps, they’re really no different than a native iOS app because all of the logic is executed on the Phone. So… Setting up the MobileFirst Platform for WatchKit is really no different than setting it up for a native iOS app, with a few exceptions. Full instructions how to setup MobileFirst Platform Foundation server with a native iOS app are available in the platform documentation. Specifically, see the Configuring a Native iOS Application entry. 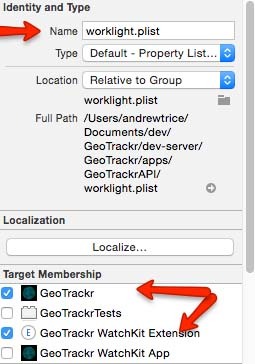 When you’re setting up your WatchKit app, you need to follow the exact same steps that you did for the native app target, just apply them to your WatchKit extension target. Then make sure that worklight.plist (which is inside of the MobileFirst API you generated from either the CLI or Eclipse Studio) so that it is included in both the native app and WatchKit extension. This allows you to take advantage of MobileFirst APIs within your WatchKit extension, complete with operational analytics. You cansave remote logs, you can access data adapters, and more. The server-side security mechanisms also work, so if you want to shut down your API for specific versions, you have that ability. I mentioned earlier, it’s just like a native iOS app, but with a few exceptions. The most important and notable exception is that the UI elements (modal dialogs, alerts, etc…) that you would normally see in the native phone interface do not appear in the WatchKit interface. You don’t get errors – you just don’t see the notification. So, you need to work around any scenarios that rely on this, and make sure you handle errors accordingly. 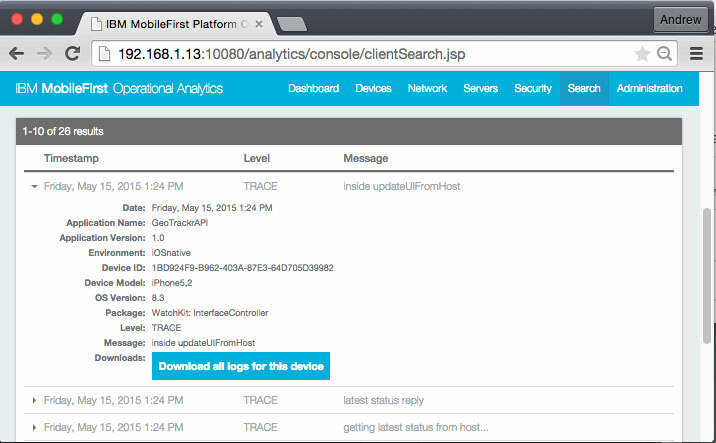 Once your app is connected, you’ll be able to access the operational analytics, remote logs, push notification management, etc… from the MobileFirst Platform Foundation server. That’s all that you need to get started! Stay tuned! Full source code will be released on my github account in a subsequent post. Also be sure to stay tuned for future entries that cover the MobileFirst platform with offline data, persisting data to the server, push notifications, geo notifications, bidirectional communication between the watch and host app, background processing, and more! I will update this post to links to each subsequent post as it is made available. Wondering what IBM MobileFirst is? It’s a platform that enables you to deliver and maintain mobile applications throughout their entire lifecycle. This includes tools to easily manage data, offline storage, push notifications, user authentication, and more, plus you get operational analytics and remote logging to keep an eye on things once you’ve deployed it to the real world, and its available as either cloud or on-premise solutions. Also, did I mention, writing apps for the Apple Watch is *really* fun! I recently put together some content on building “Apps that Work as Well Offline as they do Online” using IBM MobileFirst and Bluemix (cloud services). There was the original blog post, I used the content in a presentation at ApacheCon, and now I’ve opened everything up for anyone use or learn from. The content now lives on the IBM Bluemix github account, and includes code for the native iOS app, code for the web (Node.js) endpoint, a comprehensive script that walks through every step of of the process configuring the application, and also a video walkthrough of the entire process from backend creation to a complete solution. Client-side Objective-C code (you can do this in either hybrid or other native platforms too, but I just wrote it for iOS). The “iOS-native” folder contains the source code for a complete sample application leveraging this workflow. The “GeoPix-complete” folder contains a completed project (still needs you to walk through backend configuration). The “GeoPix-starter” folder contains a starter application, with all MobileFirst/Bluemix code commented out. You can follow the steps inside of the “Step By Step Instructions.pdf” file to setup the backend infrastructure on Bluemix, and setup all code within the “GeoPix-starter” project. Backend Node.js app for serving up the web experience.